Thrilled to be the guest blogger on StencilGirl Talk - the blog from StencilGirl Products. Head on over here to see the step-by-step process and all the ingredients that went into making this journal page. This journal page was created using different elements from each of my newest three stencils from StencilGirl. Part stencil, part mask, and all fun -- these three are from my On the Edge collection. To celebrate the release, I am giving away one stencil from the collection to 3 different readers. To be eligible, simply leave a comment on this post listing the one stencil you would like to receive. Please be sure I have a way to contact you if you are a winner. The giveaway closes on end of day Sunday July 3. Good luck! Now is the Time...great inspiration for getting started with my art! Thanks for the opportunity to win, Seth. Love all your work Seth!! I like all your mask/stencils and like to win one of them. So fingers crossed. Hard choice! Now is the time! To create, have fun & enjoy! "Now is the Time" would be my choice but I love them all!! fingers crossed! TFS! Make it count. My philosophy throughout life so it's a logical choice! Thanks Seth! Nice giveaway. Love your posts and artwork. WOuld love "Now is the time" stencil if it happens. thanks. I like them all, but "Now is the time" speaks to me the most! Thanks! "you got this" would be my choice. all the stencils are awesome. thanks for the chance tow in! Now is the time! That said I am drilling my fingers on the workspace as I await my dvd's. whoo hoo! definately the time!!! Fabulous, Seth!! Thanks for the opportunity!! You Got This.......inspiring words!!! But, I wouldn't be upset with ANY of them!! Well done!!! You got this! Great stencils...love the journal and the project on Wonderlust! You got this! Because I really want to make that wrapping paper I mentioned awhile back. I also loved that book cover you posted yesterday too. Inspired!! Oooh enter me please! "You got this" is my favorite IF i have to pick one... thanks seth, super awesome n generous of you!! :) my fingers are crossed! Great release! Your "You Got This" really calls to me. I love your Make It Count stencil! Been seeing it a lot on the StencilGirl Products facebook page in so many different looks. I love what you have created, and love all the little patterns/edges within the stencils. If open to UK, please add me to the draw. I like them all. I really do. Hopefully I can win one and I'll buy the others.n thanks for a chance? I would love to win the You Got This Stencil. I love its look and stars and small circles included, there are so many ways to add texture that It makes me so excited. Love this new inspiration, fabulous designs! Thanks so much for always inspiring! So tough to pick one fav...if I must it would have to be The Time. That one really resonates right now. Thanks so much! It is hard to pick from the great new stencils you have created. If I am picking one, I would pick Now is the Time. A great reminder that time is precious...I am looking forward to seeing more great stencils from you in the future. You can contact me at joy1515@charter.net. My fingers are crossed! They're all great and on my wish list but I think "make it count" is the one I like the best. Hey Seth. I bought your 52 card workshop from Interweave and had a blast!!! Every Monday I will do a mini journal on a card for the rest of the year! Sooooo flippin' fun, I can't stand it! These are all fabulous! If I were lucky enough to be chosen to receive one, I would have to choose what most applies to my own needs, so You Got This would have to be the one! I really like the various textures the stencils offer and I really like your style. I'd love to have: Now is the Time. It's time now do make and create with my journal and my art journaling friends! Thanks for the opportunity! Love your designs. Hard to pick this one, but You Got This looks super-fun. I have just ordered "Make it count" after agonising which of the stencils I liked the best....so if I would win I would really be happy with any one of the others, and if I would have to choose: Now is the time! "You got this" would be the one. Unfortunately, I have several friends going through rough spots & I would use it for cards. They are all great...and useful. I guess 'Now Is The Time' would be first preference because it is my motto. But then....oooooooo 'Make It Count' is a goodie too...... so's 'You Got This. All positive and motivating. These stencils are great! However, if had to choose one I would pick "You got this" . Thanks for the chance to win!! That's a difficult choice, I think 'Now is the Time'. I like all the stencils! What a nice post. I'd share these with my art students. Setho, I love that project. Your stencil/masks are brilliant. Make it count is my favorite. I think we waste too much time with the small stuff. Make whatever you do count! How generous is this! I love your stencils and would be happy as larry with any of them,but if my make a choice it would be Now is the Time. Thank you for the opportuninty! You are making them all count with your beautiful art but that's the one I love the most. All are fabulous but I think Make It Count is my fave. Love your stencils! You Got This would be the one that jumped out at me today! 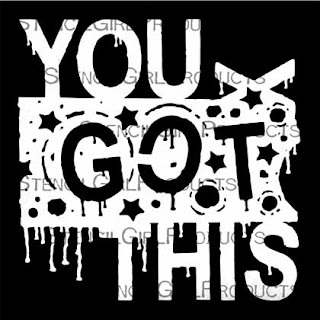 I LOVE these stencils especially the You Got This...would be thrilled to win!!! Now is the time for me to win this stencil. So much fun to see you all over the place, in and out of creative projects. You are having an amazing year! I have already purchased these stencils, but, I would love to have a spare to take to work and get my participants at the Adult Day Center into stenciling with your great stencils...I have already created an artwork with "You Got This". Hope to catch the prize... see you later today on your webinar! I will be watching...mrsjetjr at yahoo dot com. I would love the Make it Count. Can see sooooo many thing to do with it. Now is the time! Isn't that the truth? Thanks! Thank you for a chance to win one of your great stencils, Seth! 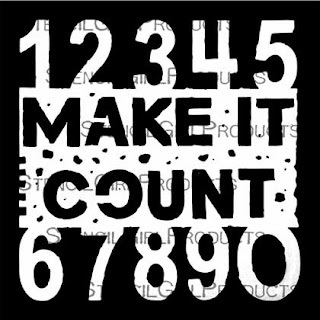 I would go for "Make it Count" because I just love numbers. Hi Seth! I love them all, and would be thrilled to have any of the three. Hmmmmm. Hard choice . . . but I guess I would pick "Make It Count." Looks like there is a trend in that direction. Make it count. I love them all but that one hits home. Hi, Seth. What fun to have a chance to win one of your stencils. I am more of a numbers girl than words- at least as far as art goes- so I would be thrilled to have a shot at the Make it Count stencil. Thanks for the giveaway opportunity, Seth. If I win a slot, I'd like the "Now it the Time" stencil. So glad to see you adding more items at Stencil Girl--stenciling has really added more dimension to my projects As a tennis coach and mother, "you got this" really resonates with me! I love all stencils and stamps. Seth, I love your stamps, dies, and stencils! I would love to be able to play with your "Make It Count" stencil. Thank you. BTW I just finished your webinar with Cloth, Paper, Scissor and thoroughly enjoyed! I took 5 pages of notes and cannot wait to being a page. Oh my goodness...how can you choose??? I think Make It Count but any of them would be great - especially as it's hard to get your stencils over here. They're fantastic! Ooh...I would love the time stencil.... such a hard selection though. Love these...so generous. I would LOVE to have the "NOW IS THE TIME" stencil. I create for a multitude of reasons, all are therapeutic in nature. These words are very special to me as they remind me how important each and every moment is. It is far too easy to let time (and memories) slip through our fingers... I have 7 children and 13 grandchildren... time does NOT wait for me! LOL - So I live my life with passion and give my all to everything I do! Why? Because Now IS the Time! I would choose "Now is the Time" stencil - very appropriate for me! Thanks, Seth! I LOVE them all Seth, but I would really like to have, "You Got This"
These are FABULOUS Seth. I would LOVE to have any of the three so if I win surprise me hehe. I like living "On the Edge" !!! ha. I love all of these stencils and find. It hard to decide which I want most. I think Make it Count but it's only just nudged the others into second place. The in and out design is fabulous. I hope there will be more of these. They're on my stencil girl club discount list for next month! They are all fabulous. The one that really speaks to me is "Now is the Time" It's kind of meaningful to me. mcsuetexas(at)yahoo(dot)com. I love all your stencils and have most of them except these! Your pages always inspired. Love the new release! My fav is "you got this" because my oldest son uses that expression a lot! Like all of your other stencils, Seth, these new ones are amazing as well - who doesn't need these in their SG collection? I know I do! Thanks for sharing a really inspiring project - on black no less!!! I really like the "make it count" stencil. One can never have too many ways to add numbers to something. Happy 4th! You can contact me via email through my blogger/Google profile (I think? lol.). Oh my Seth - these are all awesome.... I love the 'You Got This' stencil... it fits so well for my GF who is fighting cancer. I would love to get Now is the Time - because, now that I have reached 65, I figure it is my time to find my creativity and become my own person, not just a wife and mother! I like the now is the time . so very apt right now in my art life. I'm very new to mixed media work and this gives me so many ideas . Now where to start? I like Now is the Time. Thanks for the giveaway. cnikita2(at)aol(dotcom). Love them all especially Make it Count!!! Love them all, but Now Is The Time is my favorite. Thank you for the giveaway, Seth! Would love Make it count. 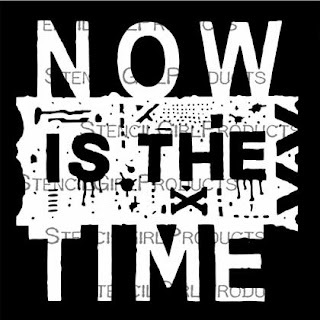 Would love to play with the Now is The Time stencil Seth!